I have a problem. Every time a holiday comes up, I spend weeks tweaking the menu and developing plans of attack to get everything done at the same time, and forget to plan meals for the days leading up to the big event. We did some of our Thanksgiving grocery shopping yesterday—incidentally, my toddler is finally bigger than a turkey—and by some miracle, we thought to pick up some catfish for a few quick dinners between now and T-day. I’ve never actually cooked catfish before, and it turns out that at least 90% of the recipes out there just call for frying it in a cornmeal dredge. I didn’t feel like frying last night, so I went with another classic option: blackened catfish. I shy away from blackening because I have such a low tolerance for spicy foods, but for once Guy Fieri’s recipe looked like it might not blow my tongue off, so I decided it was worth a try. I did, however, take the precaution of reducing the amount of cayenne called for, knowing the stuff I’ve got is fresh and extremely potent. I also made sure to have some fire-extinguishing sides to accompany the catfish: sauerkraut coleslaw and sweet potato fries. I’ve made real fried sweet potato fries once before—they were quite tasty seasoned with ras el hanout—but if I wasn’t frying the catfish, I wasn’t going to break out the oil for anything, so in the oven they went. This time I tossed the sticks with olive oil, salt and pepper, rosemary, and some grated Grana Padano, and while they weren’t ideally crisp, they also weren’t floppy or mushy, and the savory seasonings helped balance their sweet flavor. The catfish actually turned out really well. I was concerned about smoking up the house after reading some reviews to that effect—we don’t have a ventilator hood, and with the nasty weather outside, I was not looking forward to opening the windows. But after heating two tablespoons of oil in my cast iron skillet over medium heat until it was really shimmering, I timidly added the dredged fish and was pleasantly surprised by the lack of smoke. Six minutes later, we were ready to eat. Even though I was conservative with the hot spices, the fish was nearly too spicy for me to eat; Jeremy had no such trouble. I can’t be the only one who finds Guy Fieri’s recipe titles too cutesy and annoying, right? In any case, I cut this recipe in half and used probably less than a quarter teaspoon of cayenne. On a plate, mix together the paprika, cayenne, thyme, chili powder, garlic powder, cumin, salt and pepper for the blackened spice mixture. Dredge the catfish fillets all over in the spice mixture and set aside. Place the oil in a large cast iron frying pan over medium high heat until it is “white hot”. 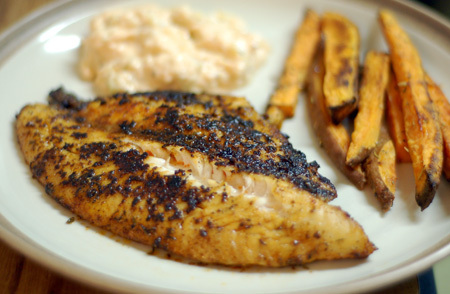 When oil shimmers and just begins to smoke, add catfish fillets and cook about 2-3 minutes per side, until a dark brown or “blackened” crust forms on the fish. If necessary, cook in batches and transfer cooked fillets to a preheated 200 degree F oven while cooking remaining fillets. Also, if your fillets are particularly thick, you may want to cover them in the pan for an additional minute or two off the heat, or pop them in the oven, to finish cooking through. To serve, top each fillet with 1/2 tablespoon of butter and serve with lemon wedges (I totally forgot about this part of the recipe, and didn’t miss it). The sugar content in sweet potatoes makes it difficult to create a truly crispy french fry from them, but roasting at a high temperature with good contact against the baking sheet helps them brown up, and I think leaving the skins on also helps give them texture and structure. Preheat oven to 400F. Line a baking sheet with a silpat or aluminum foil. Cut the sweet potatoes into strips that are about 1/4 inch wide on each side; no need to peel! Place the sweet potatoes into a large bowl. Add oil, salt and pepper, and rosemary. Toss well to thoroughly coat the fries. Stir in 2/3 of the Parmesan. Spread out onto the baking sheet in a single layer, and sprinkle with remaining Parmesan. Roast for 20 minutes, then turn fries over and cook for about 10 minutes more. Fries are done when they are browned around the edges. Serve warm. Source: Slightly adapted from Sarah’s Cucina Bella. honestly i m not so fan of sea food and never tried catfish before, but this sounds&look so charming.. I do the same thing, buying all the ingredients for Tgiving and forgetting that we have to get through Monday, Tuesday and Wednesday first! I love catfish and have a great oven-baked, pecan crusted recipe that isn’t too spicy. I don’t have it on my blog (perhaps I should!) but if you want the recipe, you can email me from my contact page and I will happily send it your way. It’s delicious! I like spicy, so your blackened recipe sounds wonderful to me too. Might have to give it a try sometime. I LOVE Catfish and yours looks sooo incredibly delicious. You did a great job cooking it for your first time! And the parmesan rosemary sweet potato fries sound so good too!